My thesis study involved research and development of a robust, procedural ability balancing system for a Real-Time Strategy (RTS) computer game. The concept behind its development was allowing a developer to implement the conceptual mechanics of a vast variety of unit upgrades, then instructing the system to programmatically generate balance formulae for the numerical values within that upgrade by means of automated playtesting. I developed this thesis in conjunction with programmer Warsam Osman's own thesis research at the Guildhall. We created a simplified RTS with high expandability through unit customization. The player upgrades the factories that creates their units, choosing between a wide variety of tank components. 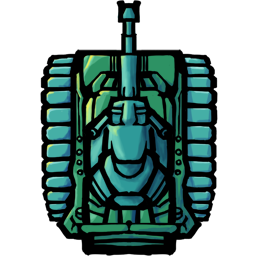 These components adjust tank attributes such as turret range, movement speed, and armor. My thesis involves creating balanced components for these game components through extensive, intelligent automated playtesting. Warsam's thesis involved using these balanced components to create an effective AI using genetic algorithms. My role in the project involved game design, generating the playtesting algorithms, and the creation of art assets. War got to code the thing.